This continued over the whole weekend. Mid-day Sunday Mateo had had enough. I was busy trying to clean up the lunch dishes and finish putting books back onto the bookshelves that we had moved, he began to pull all of his books off the shelves while sending sly, devilish glances toward me. He wanted my attention. I had run earlier that morning but had not stretched; the yoga mat was still open on the living room rug. “Let’s go to the yoga mat,” I suggested. This was met with great enthusiasm. He loves when I stretch on the yoga mat. pressing up), but then I lowered down on top of him so he was getting a bit squashed. Then I came up and suggested we get his stuffed monkey instead. So, his monkey climbed on him (with my assistance), then we switched and his monkey climbed on me. Then Mateo climbed on me and the cat climbed under my legs, then Mateo followed her under the tunnel of a pelvic lift. This physical bonding and physical play together is so important to young children. It centers them, helps them center physically with all the movement, and emotionally by being close to a parent. As parents we are the center of the lives of our children and we are where they can come back to when they need to be secure, or just to organize their busily building brain, a place where they can center themselves and be comfortable. So we played tunnels and it was great fun, for the stuffed monkey, the cat, the toddler, and me. And I finally did a little extra stretching and physical activity for myself. I found a running partner! Today I will go for a run with a new running partner, if I can coordinate meeting with her at the correct time. I will be great if we can, for both of us. It always helps to have a partner especially when winter arrives and it’s cold and dark outside, very difficult to motivate for running and especially when I haven’t slept enough. She is a mother of two cute little girls, I think her second one is close to 6 months now. I will finish the log when I return. Okay, that was a hard run, too fast, and plenty long. My new running partner is very good; an endurance runner. We did a loop around Cadman Plaza running loop (which I adore, the rubberized surface is fantastic), then we headed down Middagh Street to the Promenade, and up Montague Street with a confused turn onto Clinton, to Pierrpont Street to get to Cadman Plaza West, turned onto Tillary Street, then onto the entrance to the Brooklyn Bridge (I didn’t realize we were turning so there was a momentary collision of two sweaty, heavy breathing mothers as I went straight and she turned), then the difference between the two of us really became apparent as we reached the stairs going down off the Brooklyn Bridge that would allow us back into our neighborhood of Dumbo; she was ready to keep going, I was ready to call it a day. The rounds were not consecutive, many poses became tunnels for Mateo: downward dog, plank, the step backs. Then Mateo climbed on top of me in the middle of a round and I held plank position with him on top; 25 pounds of toddler is a great challenge for the stabilizing muscles of the torso and shoulders. 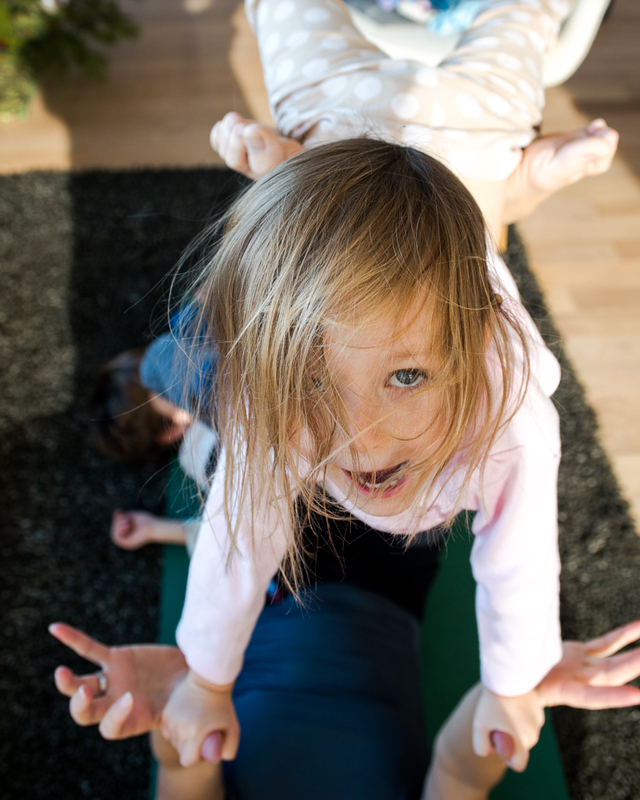 I attempted Vashisthasana, but Mateo decided it was time to climb on me again. It was time to end the session, Time to just be, no more trying to get in one more pose. Mateo cuddled up in my lap, resting his head on my belly. Arms wrapped around my waist.